CarGurus has 239 nationwide Ghost listings starting at $89,996. Hey, what do you know, a Rolls-Royce affordable enough, relatively speaking, that the average multi-millionaire without a manservant (or maidservant) can research and buy this exquisitely wrought automobile in person. And better yet, the 2014 version of this 5-place ultra-luxury sedan is such a kick to drive that even the chauffeur might get a few extra days off. Additionally, this year the single Base trim is amended with an up-powered Ghost V sub-trim featuring some added ponies and a few other upgrades to wheels, colors, chrome and graphics, the latter, of course, all hand-rendered. Improvements to the Base version for this year, meantime, include standard 20-inch alloy wheels, added colors and upgraded interior trim finishes, a bump in personalization offerings and most noticeably, upgrades to the standard navigation suite. 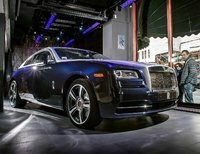 Though resting at the “lower end” of the Rolls-Royce lineup, the Ghost nevertheless offers that traditional pampering and uber-cachet of its Wraith and Phantom siblings and a price tag that’ll keep it attainable to the great unwashed only through winning a national lottery jackpot. In any case, the Base Ghost iteration can once more be delivered in an EWB sub-trim that sports an extra 7 inches of wheelbase length (136.4 inches total) and an extra 6.5 inches of overall length (219.3 inches total) as compared to the more garage-friendly Base trim’s 129.7-inch wheelbase and 212.6 inches of overall length. This added length (unavailable for the new Ghost V), though providing considerably more rear-seat legroom, does not improve the comparatively paltry 14 cubic feet of trunk space common to all three variants. Anyhow, standard amenities in the 2014 Ghost include those new-for-2014 20-inch alloy wheels, a power sunroof, heated, reverse-tilt power-adjustable outside mirrors, premium leather upholstery, full power accessories and heated power-adjustable front seats. Cruise control and telescoping tilt-wheel steering return for 2014, as do 4-zone automatic climate control, Bluetooth-bolstered Rolls-Royce Assist directions and connections technology, and leather, genuine wood and genuine alloy cabin accents. Memory for driver's settings, a remote garage-door opener and an auto-dimming rear-view mirror also remain standard, as does a 600-watt premium audio system boasting a single-CD player, 16 speakers, satellite radio and auxiliary iPod/iPhone integration. Finally, the aforementioned upgraded navigation system that includes 3D imaging and a writable touchpad is also delivered standard. A plethora of interior and exterior colors and patterns also remain offered, with a couple of available Driver Assistance packages offering such boosted safety technology as adaptive cruise control, blind-spot and lane-departure warnings, a head-up windshield display and a rear-view camera also available. Powering the 2014 R-R Ghost is the dependable and potent turbocharged 6.6-liter V12 engine that mates with the ubiquitous 8-speed automatic transmission for 563 hp and 575 lb-ft of torque in the Base and EWB variants. In spite of standard variable valve timing (VVT), look for a somewhat swine-like 13 mpg city/21 highway from this hefty 12-banger. The Ghost V packs this same drivetrain with some added tweaks eking out an extra 30 hp for a total of 593 horses altogether, while torque remains the same as that in the less-exotic Base. Though your typical Rolls is rarely mentioned in accident reports, this latest Ghost manifestation remains toting standard 4-wheel antilock brakes (ABS), traction and stability control, front and rear head airbags, front side-mounted airbags and active front headrests. Self-leveling high-intensity-discharge (HID) headlights, daytime running lights, Rolls-Royce Assistance emergency alerts and communications, a post-collision safety system and a remote antitheft alarm are also standard aboard. 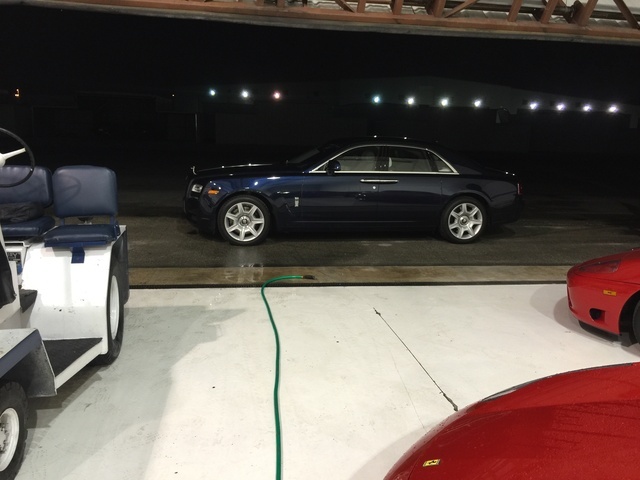 What's your take on the 2014 Rolls-Royce Ghost? Users ranked 2014 Rolls-Royce Ghost against other cars which they drove/owned. Each ranking was based on 9 categories. Here is the summary of top rankings. 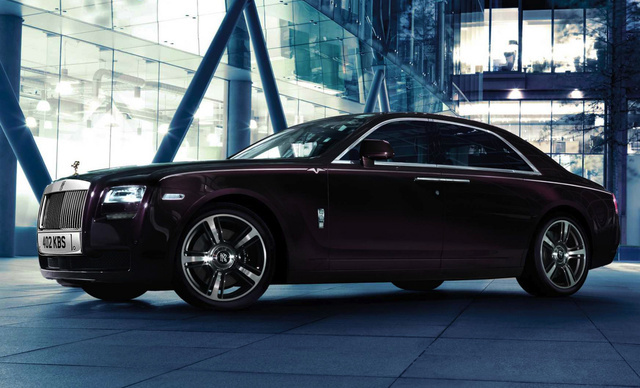 Have you driven a 2014 Rolls-Royce Ghost?